The nectar flow appears to have run its course. My bees are still in robbing mode. If there is any uncovered honey or syrup around, the bees find it and are after it in big numbers. When bees display this robbing behavior, the nectar flow has usually stopped or has ended. The upcoming week will be hot and humid. Pulling honey with fume boards works very well in hot weather. The bees leave the supers very quickly. If no queen excluders were used on the hive and there is some brood in the supers. The bees will not leave the brood with a fume board or a bee escape. The only way to get the bees off the frames is with a bee brush. If supers are pulled in the humid weather, the supers should be put in a room with a dehumidifier and a fan running. If the supers are placed in a large area, like an open basement, plastic tarps should be put up to make a temporary room so the dehumidifier would work more efficiently. I usually pull my honey then leave it in my honey house with a dehumidifier for at least a week before I extract. 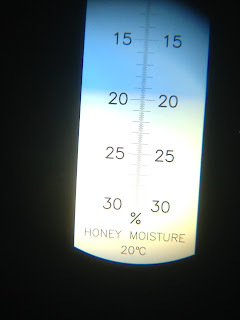 The dehumidifier will help get the moisture of the honey down to US Grade A level, which is 18.6% water content or less. It is easier to get the water content lower now, before you extract, than after it is after the honey is in a pail. 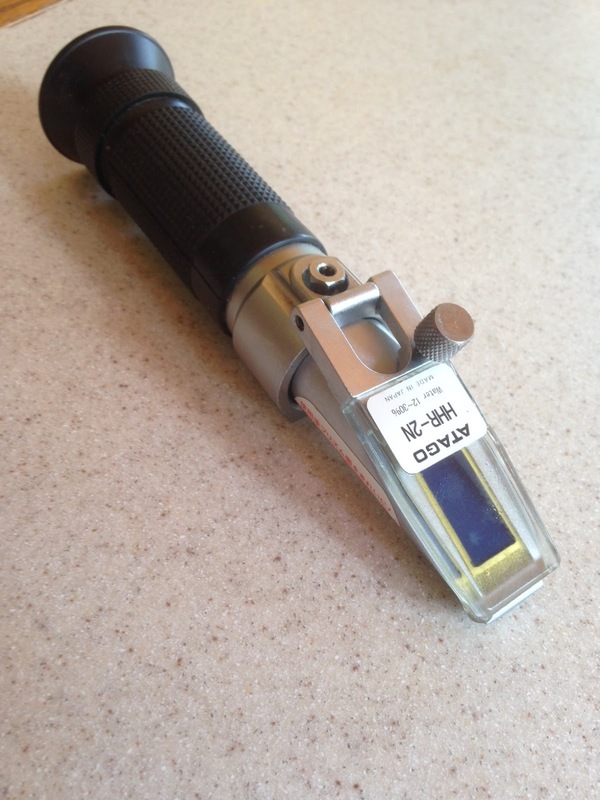 I do check beekeepers honey with a refractometer to see what their moisture level is. This is a free service I do for my customers. Bring me or mail me a small sample, but fill the container with honey. I only need a thimble full sample. So a small vial works well. A full honey jar is ok also. Honey that is not US Grade A will ferment with time. Beekeepers who purchased their bees from Louisiana, Georgia, Florida, Texas. Have to be careful if your hive has small hive beetle. If the beetles are in your supers and no bees to stop them, the beetle may start laying and beetle larvae can quickly spread. I have heard to prevent this, the beekeeper needs to get the room with the supers down to a relative humidity of 40%. Speaking of hive beetle. I had a beekeeper that had his bees near a beekeeper that got his bees from Louisiana. The beekeeper had his hive infested with beetles from his neighbor. Small hive beetle can fly up to 20 miles. If a hive is weak it can be very susceptible to beetle activity. In this case, the beetles got so bad that his bees absconded. Once the ground temperature reach 54 degrees the beetles can no longer pupate in the soil. Refrigerator temperatures kills the beetle in all stages. Beetles can live in the bee cluster throughout the winter. Strong colonies of bees will keep the beetle in check. Oxalic Acid is a recently approved mite treatment for Varroa Destructor. Oxalic Acid is a late October mite treatment used when no brood is present in the hive. Treat for Varroa in August or early Sept. Use Miteaway Quick Strips, ApiGuard or ApiVar strips. These mite treatments have good results. Then in late October treat with Oxalic Acid. The late treatment will kill any mites that have reinfested the hive during the robbing period of September and early October. When bees try to rob honey during those times, mites can hop off the robber bees and then reinfest your treated colonies and you may get a high level of mites again. If you wait to treat past the August to early September treatment window the bees will be getting damaged by Varroa. The longer you wait to treat, the more damage Varroa does to the bees. Waiting to treat in October, your bees may be so far gone they will die over the course of the winter. Randy's bees are in California so after reading his article you need to form your own conclusions of how effective it would be in northern climates. The dribble method may not be an option if it is cold in late October. You may not to want to get your bees wet. The other method is the Vaporizer Method. 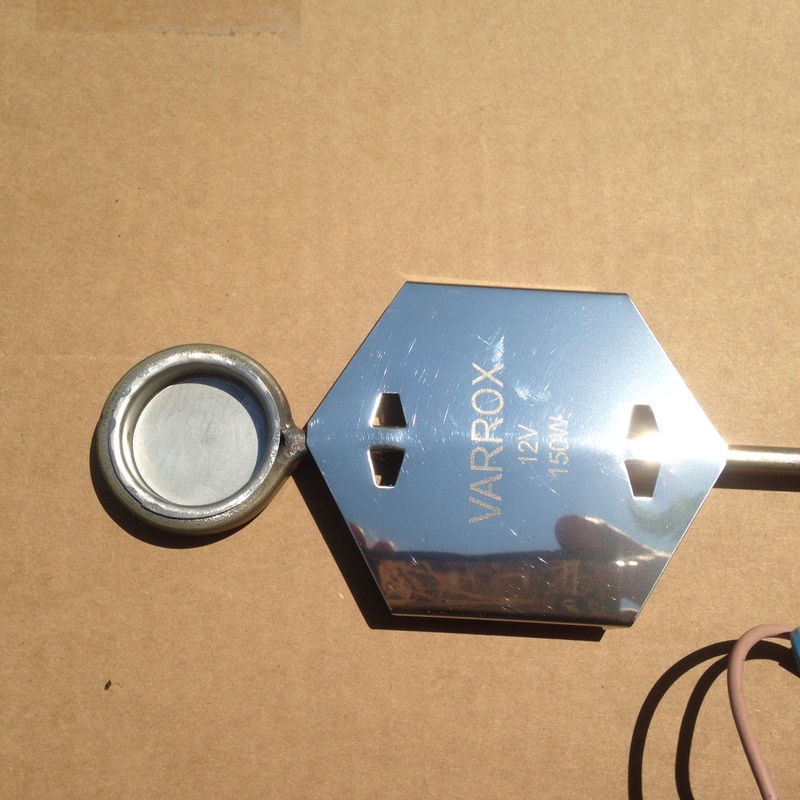 Nature's Nectar LLC does now carry the Varrox Vaporizers. 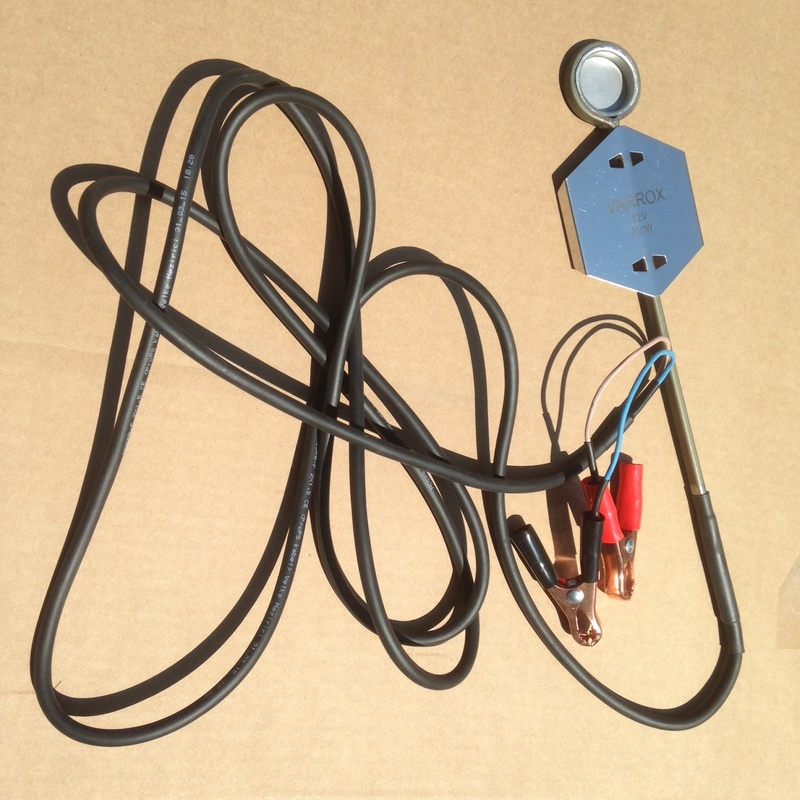 The vaporizers are widely used in Europe. The following video is put out by the Varrox manufacturer. Double click on the video for full screen. Joe Pye weed is blooming around the metro. A pollinator and honeybee favorite. Goldenrod is blooming around the metro area. I am not sure if there is a flow there or not. I see my bees have robbing behavior and not really on any Goldenrod. Robbing behavior happens when there is no nectar flow. Maybe as the week progresses the Goldenrod will still produce some nectar. 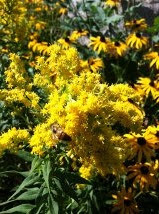 Maybe the Goldenrod is producing nectar in your locale. 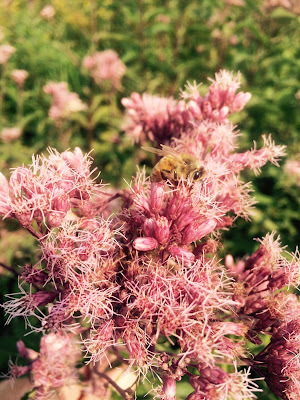 You know if you are getting Goldenrod honey if the hive has an odor of wet sweat socks. The odor is temporary, as soon as the honey ripens the wet sweat sock odor goes away. This nectar flow is the last major flow of the season, The only other big possible flow a beekeeper may get is an uncut alfalfa field. Miteaway quick strips are a 7 day mite treatment. They cannot be put on if the temperature is over 84 degrees for the first three days of treatment. Honey supers can still be on the hive. The new label now says, to stay upwind of treatment strips. Rubber gloves must be used when handling the strips. Water should be with you in case of eye contact, water is used for flushing purposes. MAQS are sold in 2 hive, 10 hive and 25 hive treatment packs. It does not keep. Purchase only what you need. Always read and follow the manufacturers label instructions when using MAQS. Apiguard is a 30 day mite treatment. Supers must be off the hive. The odor of the thymol will damage any honey in the supers with its strong odor. The thymol gel is packaged in foil tins. Peeling back the cover exposes the thymol gel. One foil pack is put on the hive for 15 days then another tin for 15 days. 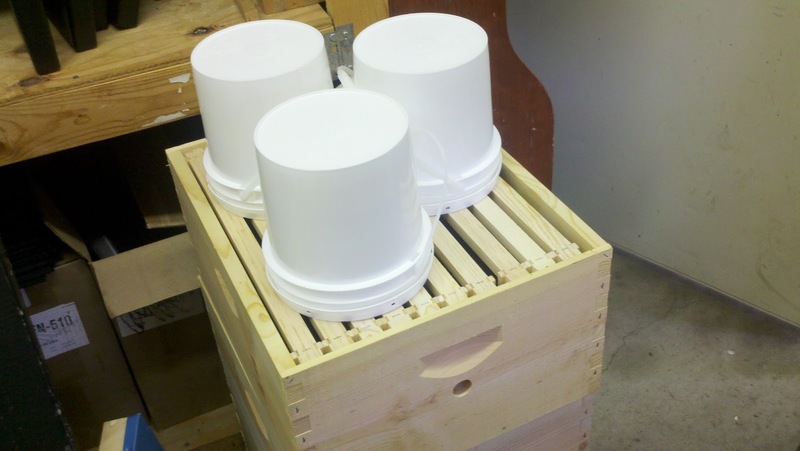 A wooden frame is needed to lift the hive box 3/4" so the bees can have access to the tin. Apiguard needs to be put on as early as possible in late summer. As the daily temperatures cool into the 60's Apiguard becomes less effective. Available in 5 hive treatment packs, 10 tins per package. It keeps for two years. Always read and follow the manufacturers label instructions when using Apiguard. ApiVar is a strip that carries the miticide Amitraz. The treatment is two strips per brood box. Supers must be removed when using ApiVar. Rubber gloves are used when handling this ApiVar strips. Apivar is a contact strip. The bees must come in contact with the strip. This is a 6 week treatment. ApiVar comes in a ten strip or 50 strip foil package. Always read and follow the manufacturers label instructions when using Apivar. All of these treatments are effective against Varroa Destructor. Hive Light On Winter Stores? Mass feeding in late summer is easy. Three one gallon feeder pails right on the frames. 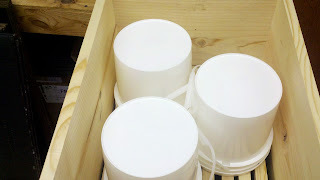 Three one gallon feeder pails covered with a deep. In late summer the bees will empty the three pails in about five days. 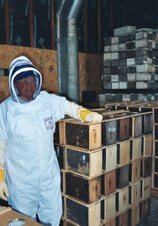 This time of year a beekeeper needs to check the hive for winter stores. If the colony had swarmed earlier in the summer, the hive might have missed the nectar flow and need some feeding. Waiting to feed later in the fall does have some pitfalls. If it cools off, the bees won't take the feed very well. Feeding spurs brood production. Normally, it is best to get the brood production to stop by late October. By feeding late, there may be brood in a colony past Thanksgiving. Having brood in a colony late, increases food consumption and colonies can starve easier in late winter. Right now the top brood box on a hive should pretty much be full of honey. If your colony does not have a full box of honey, feeding should start now. Don't wait to feed. Remove your supers. The bees will take feed very well right now. I would move full frames of honey to the outside of the top box and empty frames to the center. The bees will fill up the center frames easier that way. Feed heavy syrup 2:1 sugar and water or feed ProSweet bee feed. On the other hand, if your hive swarmed and all of your brood area is full of honey. You may need to extract out a few of the frames in the bottom box so the queen has room to lay. With the humid weather a beekeeper needs to think about pulling honey. It is ok to pull the honey and extract it but, the beekeeper should not leave it in a garage or a non air conditioned space for a long time. Leaving honey off the hive in humid weather can make the honey's moisture level rise. The wax capping's can absorb moisture thru the capping's and into the honey. On very humid days. a super pulled off the hive if it is allowed to sit in the humid air, the moisture in the honey can rise 1% in a day. So if your honey is 17.7% which is a good moisture level, if it went up 1% to 18.7%. The honey would no longer be Grade A honey and the honey may start to ferment after a few months. Moving the honey into a room with a dehumidifier running or an air conditioned space will prevent the honey from absorbing moisture. Now that the nectar flow is winding down some thought needs to put into how the honey is going to be removed. Here is a couple ways to pull honey. These are two links to my YouTube videos. You can use Honey Robber or the better smelling Honey Bandit. Honey Robber works best. Honey Bandit works great if daytime temperatures are in the upper 80's. Right now some beekeepers may be getting nectar, some beekeepers may be not. If I was going to put a number on it. I would say that the nectar flow is 85% done for most of us. Any beekeepers with large fields of Alfalfa, Buckwheat or Purple Loosestrief are still getting a good flow. The rest of us, are getting the last stages of probably one of the best nectar flows in many years. This is the nectar flow chart from Warner Nature's Center. It is from Paul Liedl, volunteer beekeeper from WNC. He has put together this hive on a scale that helps put the nectar flow in a calender setting, with the accumulation of nectar through the summer. Warner Nature's Center is more heavily wooded than the perfect bee location. But the bees do make it happen and did put up some honey. This is what Paul said about his hive that is on a scale. I was at Warner today and hive #3 is still gaining weight but at a much slower pace. 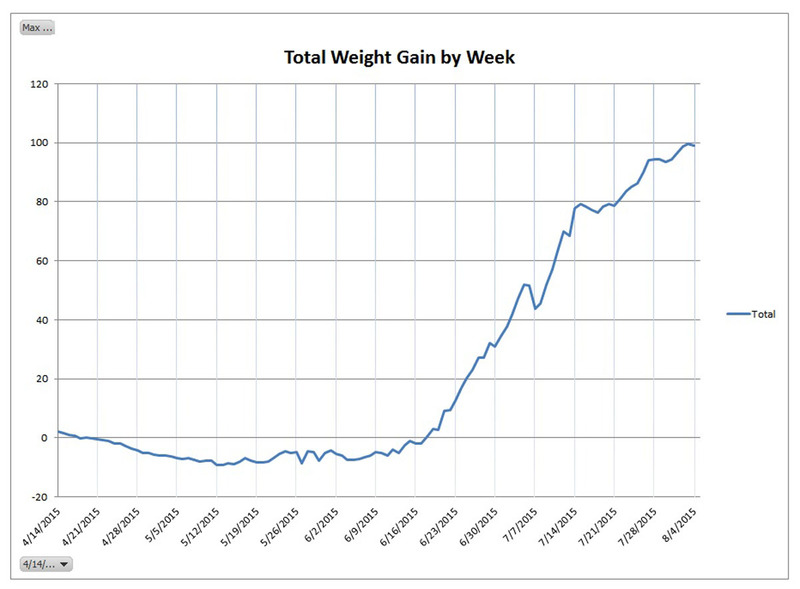 Total weight gain for the past week was only about 6 pounds. As you can see from the attached graph the nectar flow stopped around 7/14 but started up again a week later at a much reduced rate. Still not getting any goldenrod nectar even though they are beginning to blossom. 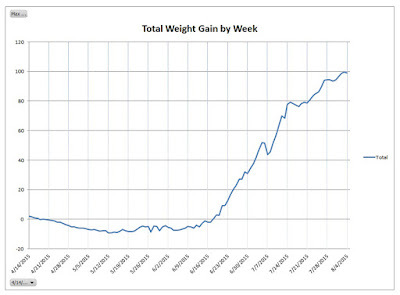 The attached graph is only plotting the maximum recorded weight each day.